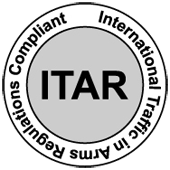 International Traffic in Arms Regulations (ITAR) is a set of United States government regulations that control the export and import of defense-related articles and services on the United States Munitions List (USML). These regulations implement the provisions of the Arms Export Control Act (AECA), and are described in Title 22 (Foreign Relations), Chapter I (Department of State), Subchapter M of the Code of Federal Regulations. The Department of State Directorate of Defense Trade Controls (DDTC) interprets and enforces ITAR. Its goal is to safeguard U.S. national security and further U.S. foreign policy objectives. The related Export Administration Regulations (Code of Federal Regulations Title 15 chapter VII, subchapter C) are enforced and interpreted by the Bureau of Industry and Security in the Commerce Department. The Department of Defense is also involved in the review and approval process. Physical enforcement of import and export laws at border crossings is performed by Customs and Border Protection, an agency of the Department of Homeland Security.